Attention Whole Foods shoppers! Another Whole Foods One Day Sale is running on Friday, 8/22. 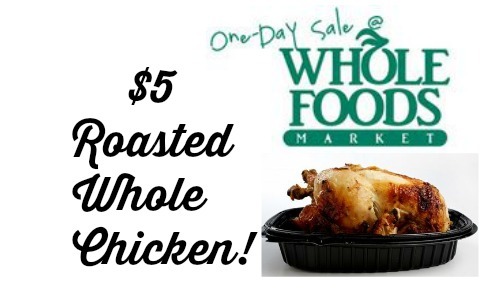 Get an antibiotic and hormone-free Roasted Whole Chicken for $5! One Day Sales can vary by region so call your store to check first! Hopefully you can hit this sale for a quick, easy, and delicious dinner! One tip for rotisserie chickens is to save the bones. Roasted chicken makes THE BEST homemade chicken stock! Do you have any favorite recipes that use rotisserie chicken as a starting point? Check out all the Whole Foods deals!